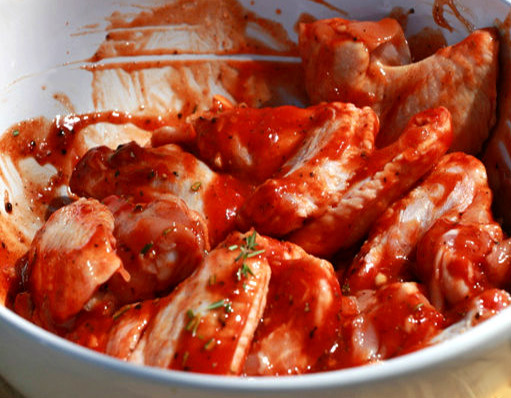 Cut chicken and rinse with cold water. Grate the onion by hand with a grater or use a food processor. You will need about 2 tablespoons more or less is fine. In a saucepan over medium heat, saute onions in butter stirring often and add the garlic. Add the tomato sauce, cayenne sauce, honey, cumin and cayenne pepper. Raise to high heat and bring to a boil. Reduce heat and cook on low for 5 minutes. Stir often. Remove from heat and allow to cool. When sauce is completely cool, place chicken pieces in a resealable plastic bag. Add 1/4 cup of the sauce. Seal bag and toss gently. Refrigerate for 1 hour. Store extra sauce in refrigerator for later. Preheat grill. 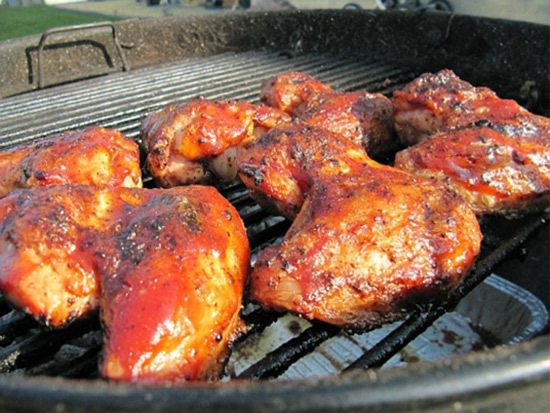 Grill chicken for 25 to 30 minutes, depending on thickness of the chicken. Brush with extra sauce near end of grilling time. Reserve half of the sauce for serving with chicken. Spicy Grilled Chicken is served on your favorite salad greens. Enjoy!